They say clothes make a man. Not true in my opinion. But better cameras and longer lenses are always on a bird photographer's mind. A very well-known and accomplished professional bird photographer decided to sell all his Canon gear after 40+ years and switch to another brand. I got an excellent deal on a hardly - used top of the line Canon full frame 1DX Mk II camera. This is Canon’s flagship camera. Although the software setup is similar, it weighs a pound and a half more than my "old doohickey". I do a lot of hand - held shots so this extra weight makes a huge difference in my ability to keep in - focus and track fast-moving birds. I decided to give it a workout at the local rookery using a tripod to support the added weight. The Great Egrets were mating and the males do a spectacular mating display. They have breeding plumes that they flare out similar to a peacock. A male started its display with his heads lowered and raised it with an arched neck in a continuous motion. It ended with the neck arched way back over its body with all the neck feathers sticking out. Apparently, it does the trick as the females continue to swoon over it. 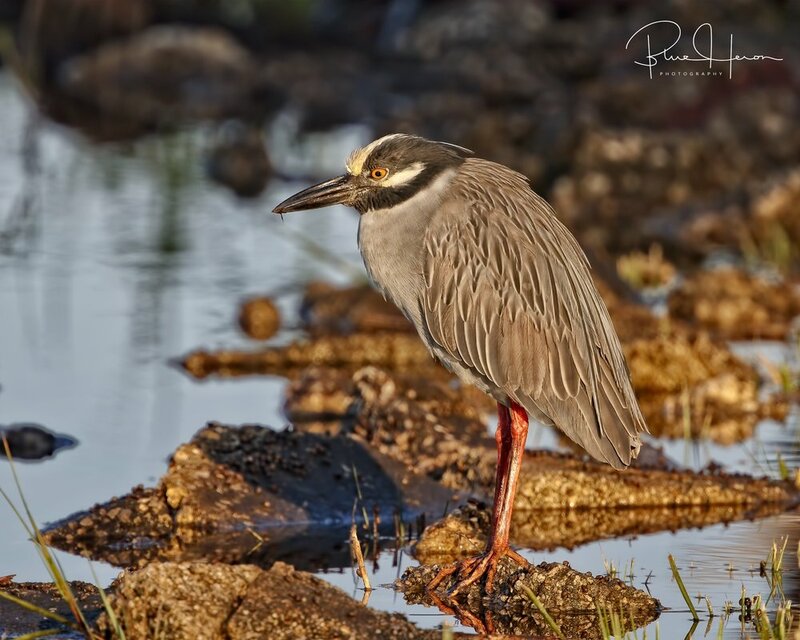 My prior rookery blog was a morning shoot, this was an afternoon one. The sun was low and setting and made for some spectacular light and photo opportunities. He ain't heavy, he's my "Dooohickey"
Great Egret Display, the head is usually lowered at the start..
How was that one? Can I get an AMEN! Apparently the display works...see the results ! Those Great Egrets got nothing on me says the Snowy! Back on the Broward enjoying the springtime weather. Got some photos of snow covered lawns though from some of my friends and relatives. It is definitely spring in the south though. Coffee is hot and I venture out to the dock. I spot an old friend and get some surprise visit from some new ones. In the past few weeks I have spotted George, the Yellow-crowned Night Heron, a few times. I was wondering if he would return since the tree he used to roost in was gone due to Hurricane Irma. This morning found him sitting on the bank looking for minnows. As I sat down on the dock some ducks flew by and landed behind me (but into the sun). 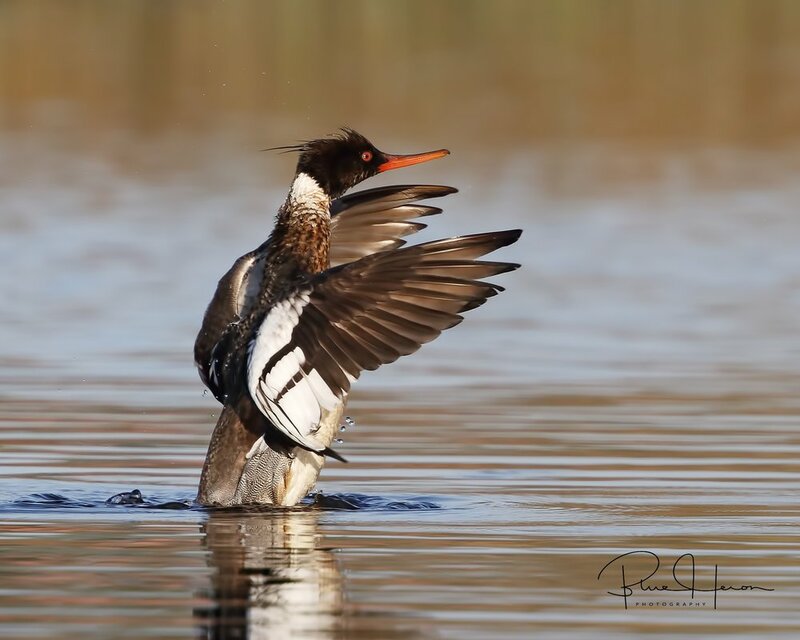 It was a male Red-breasted Merganser and some females. I have only seen this species once before. I sat still as they swam directly towards me while feeding along the shallow water near the bank. I could scarcely breath as they swam right up to me and went under the dock and into the lagoon. The sun was now at my back and I could capture the beauty of these colorful ducks. I stayed still and could not believe they had not spooked. 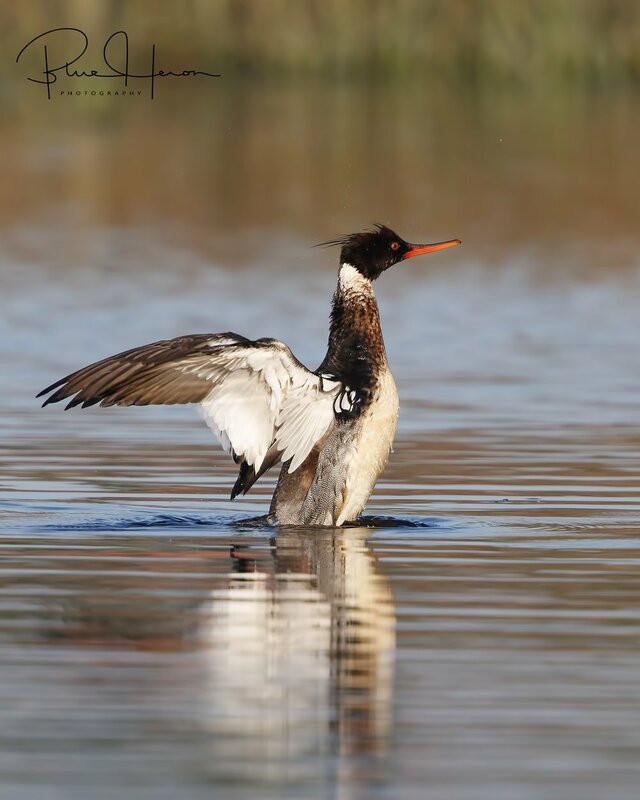 They continued to feed in the lagoon and the male sat up in the water in a classic Merganser wing flap. A Brown Pelican flew by and dove into the channel in front of me. I was amazed at what I saw when I processed the photos. You would think it would be going after a huge fish. Instead it deftly plucked a few minnows using its long beak like chopsticks and swallowed them. A few Tricolored Herons remain on the Broward along with the Great and Snowy Egrets. The latter are dwindling in numbers as they migrate north. Also captured a first sighting as the Editor and I were having coffee on the porch. A Great Crested Flycatcher was gathering nesting material from a nearby abandoned nest. It was indeed a pleasant surprise. The surprise visits lifted my spirits just when I was down because most of my feathered friends are nesting or molting. Hope they brighten yours too! Blessings. 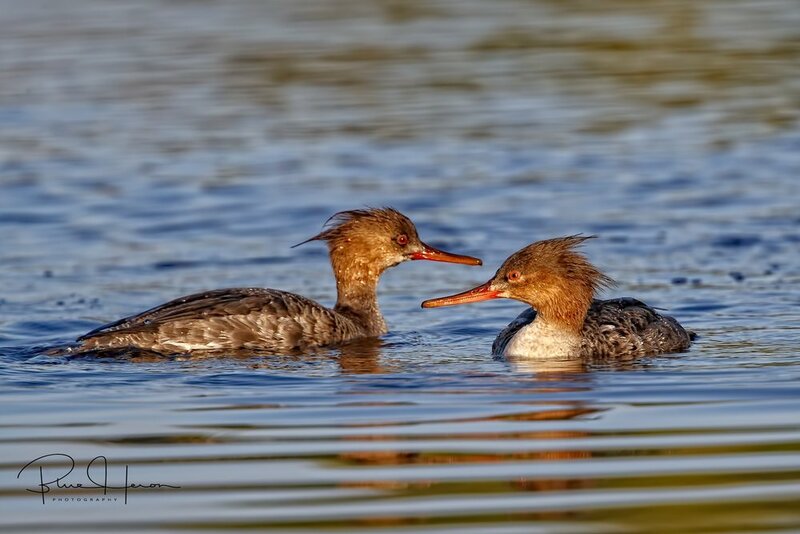 Male Red-breasted Merganser and some females make a surprise visit to the Broward. Just got my hair feathers done at Janet's but look at my nails now! Red-winged Blackbird female balances on the marsh grass.. Male Red-winged Blackbird flashes his arm bands.. Morning Grace...Great Egret glides up the Broward..Blessing! A first for me, Great Crested Flycatcher..nice surprise! It is 0430. No problem, been up since 3 when the crazy cat attacked my feet. Time to wake the Editor for a road trip. One of her favorite birds is the Pied-billed Grebe. A friend reported seeing some baby Grebe chicks at one of my favorite wetland sites a few hundred miles south of us. Coffee cups full. We pack up and head south. We arrived at the wetlands after a nice breakfast stop. The sun was already over the horizon and birds were winging in the air. One of my bucket list birds is the Black Necked Stilt. Some were reported at the wetlands also. As we drove around one of the “click ponds” I spotted about a half dozen Black Necked Stilts. Click. The doohickey does its magic and I added another first to my growing list of birds captured. The wetlands have a series of drainage and filtering ponds. We drive around where the baby Grebes were reported but no luck. Some familiar feathered friends are there though. We see Glossy Ibis eating huge tadpoles, Little and Great Blue Heron juveniles, Red Winged Blackbirds, Snowy and Great Egrets, Anhingas and even a female Northern Harrier. I was hoping the Harrier had not spotted the chicks and grabbed them. Undaunted we make another trip around the ponds. I zoom in on a lone Pied Billed Grebe and lo and behold. On its back was a cute little baby Grebe taking a ride, baby duck style. Got it! The editor was happy to see it too! I revisited the spot a few weeks later and found mom and the Grebe chick doing well. A first for me, I capture this Black Necked Stilt at the wetlands.. This pretty eyed wading shorebird has been on my bird bucket list for a while...hope to capture some more.. The Anhinga Chicks have hatched and are growing fast..lots of food needed to keep them happy! The Great Blue Heron hatchling does a wing stretch, it should fledge any day now.. The adult Great Blue Heron searches the march grass for food for the growing young. Grumpy Blue....All I ever hear from those kids is get me more food! It also catches a big fat tadpole for breakfast..
Red Winged Blackbird sounds the alarm ,,predators spotted in the air! Boat Tailed Grackle balances on a cattail.. The Editor spots a flower and asked for a photo.. Some Cattle Egrets in breeding plumes are spotted too! Finally we spot the baby Pied Billed Grebe nestled on Mommas back! What a ride! Returned a few weeks later,,the baby has grown! Too big to ride on Mom's back now. Blue skies, a slight breeze, temperatures in the 60s and 70s…perfect spring weather. This time of the year is all about the birds and the bees. The later stings you and the former poop on you if you are not careful. But there are some other things going on too. 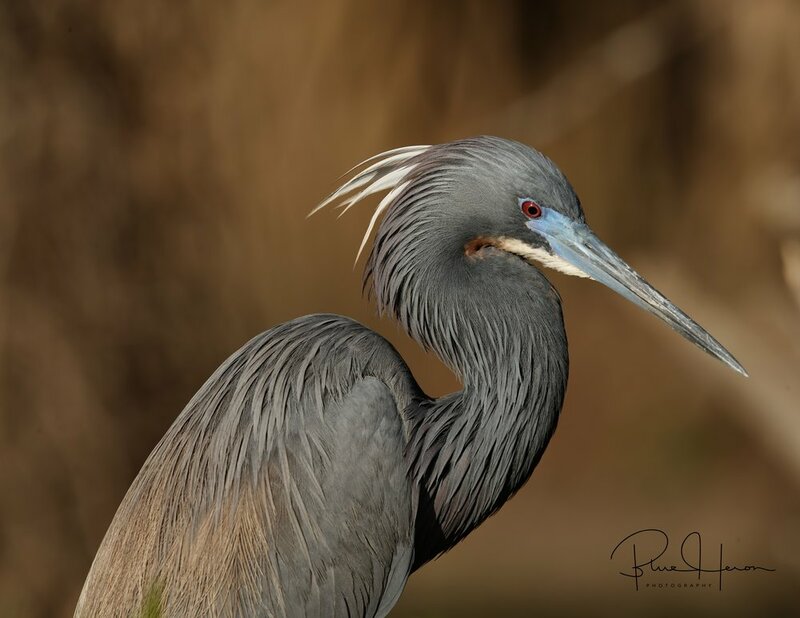 A good friend and fellow photographer and I recently made a day trip to one of our nearby rookeries to visit the nesting marsh birds. 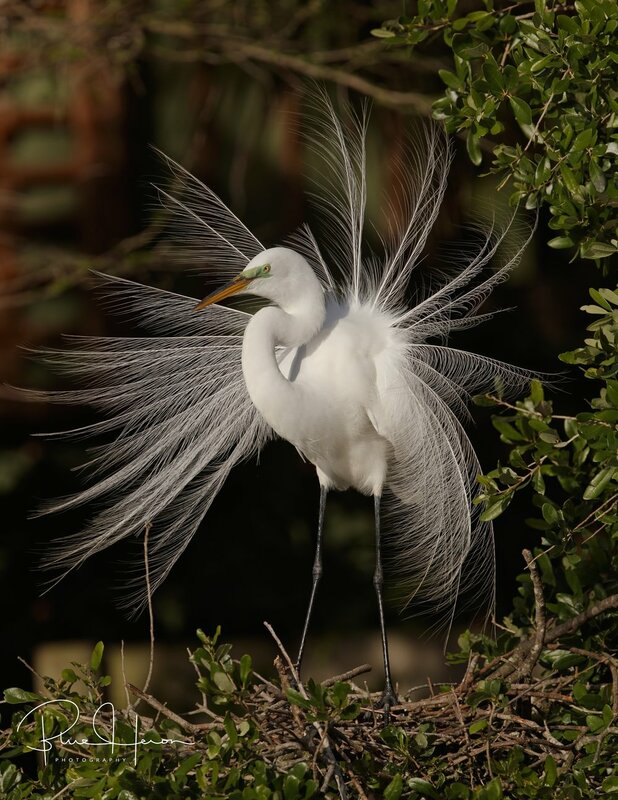 Spring was definitely in the air..
One of the most graceful birds on the Broward is the Great Egret. During mating season the lore (or area around the eyes) turns green. The Egrets develop beautiful wispy white mating plume feathers on their back (those beautiful feathers almost led to their extinction). 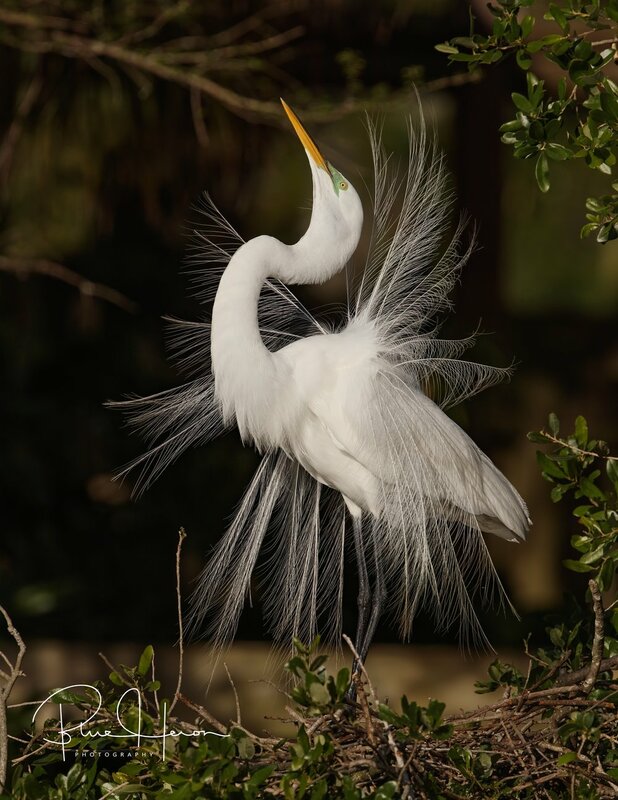 Per the Cornell Laboratory of Ornithology “More than 95% of the Great Egrets in North America were killed for their plumes in the late nineteenth and early twentieth centuries. Plume-hunting was banned, for the most part, around 1910, and Great Egret populations quickly began to recover.” The rookery we visited had dozens of mating pairs busy building nests and doing what birds do during mating season. These graceful beauties and their wispy plumage made for some breathtaking photo opportunities. While I was standing under a tree close to the board walk capturing these images, a Roseate Spoonbill above me took the opportunity to “white wash” my camera and my lens. Next visit I will be more careful where I stand. I love to share the beauty of nature and creation with you. Hope you enjoy these spring scenes. With all the negative news it is refreshing to see some springtime moments too. Note: This post is Bird R-rated for mature audiences. Blessings. Step A. Go fetch a stick.. Step B..She loves sticks for the nest. Step D. Go get another stick...then repeat steps A-D..Don't you just love springtime! The April showers have begun. Went to our local zoo. They have been doing some groundbreaking research in DNA reconstruction from ancient dinosaur bones. Shades of Jurassic Park. I thought it was all fake at first…and then I saw them. All was normal as I began my journey through the zoo. There were indeed some odd looking storks but nothing that could be considered prehistoric. As I walked through the dense bamboo jungle the ground began to shake. As I rounded a stone covered pathway I came face to face with something from the ancient past. This prehistoric bird sure took my breath away. It nearly took my arm away too! A guttural noise behind me shook me to the bones. I looked into the open jaw of a toothy dinosaur that obviously had not flossed in a while. The stench of the rotting carcass it had been munching on filled my nostrils. I began to run through the jungle path. Around each corner a new gigantic lizard like form would appear. I could not believe my eyes. OK. April fools! It was just a traveling “Destination Dino” exhibit. The animated dinosaurs looked almost surreal. Almost, except for the part with the all the "Mommies" pushing duel and triple wide baby strollers through the terror filled jungle. Avoiding being run over by them was the most dangerous part of the journey. One of these days in heaven we are going to get the real answer on the dinosaurs and mystery of the creation. You know when the earth was without form and void. Sorta like our politicians brains of today. Not much has changed really. So much for the theory of evolution. Blessings. The Painted Stork has some pink in the feathers and very colorful..
Black Vultures have replaced some of the Wood Stork nesting spots. This Marabou Stork has some prehistoric features.. Suddenly things began to change..looking more ominous.. This prehistoric bird nearly took my arm off! I almost bumped heads with this monster! Then something poked me from behind..run! The ground shook as this huge head emerged from the jungle deep..
RUN! There are crazy Mommies with double wide kid strollers loose!